Charmaine's Pastry Blog: Would we? Posted by Charmaine at 2:51 p.m. They are gorgeous - am bookmarking and hopefully making soon!! January 5, 2009 at 8:32 p.m.
Bookmarking this recipe, too! Awesome photos! January 6, 2009 at 4:38 a.m.
Ahhh UBC cinnamon buns!!!!!! The Totem cafe didn't do any favors to my waistline either! January 6, 2009 at 5:54 a.m.
January 6, 2009 at 6:17 a.m. I cannot stand cloyingly-sweet cinnamon buns. I can only bear a few nibbles before I am in sugar-overload. These look absolutely perfect - I do believe I'd be tempted to eat a whole one ... or two. Or more. A definite must-try. Happy anniversary to you both! January 6, 2009 at 10:13 a.m. Happy anniversary to the both of you!! I can't believe it has been five years already!! May you have many many more years of happiness together!! I absolutely adored the UBC cinnamon buns when I went there. January 6, 2009 at 2:13 p.m.
Aww - happy anniversary! 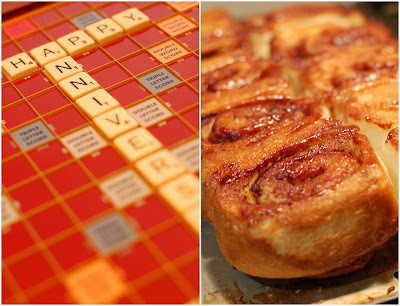 That looks like one hell of a good time - Scrabble and cinnamon buns! What could be better? If you ever need more wood ideas, how about cedar planks for making salmon? Haha, ok maybe scrabble is better! Love it! January 6, 2009 at 2:17 p.m.
January 6, 2009 at 3:26 p.m.
January 6, 2009 at 7:14 p.m.
mmmmMMMMMmmm UBC cinnamon buns. The Vanier caf would take the stale, unsold buns from the week and make french toast out of them every saturday! Deadly. Happy Anniversary :) and hope you're enjoying the snow-rain mix we west coasters are experiencing. January 6, 2009 at 11:00 p.m.
January 7, 2009 at 11:03 a.m.
Lovely recipe and a great little story - bookmarking that to use in the future! January 7, 2009 at 11:08 a.m.
Incredibly smashing! If they're as tasty they look, you're a star!
? Since you have used pastry rings do yo think they'd work for English muffins, sized appropriately? Best material? Nancy Silverton uses tuna fish cans (tin)-- I prefer to buy new. March 5, 2009 at 8:57 p.m.